In my continued theme of quick and simple bakes, I made double chocolate and peanut butter cookies. To make these, I used a bag of Reese’s peanut butter chips that I brought back with me from the States after Christmas (However, I did see these on Amazon for those of you in the UK). I think next time I made these, I want to try them with Reese’s Pieces, just to get the color added in. The oranges and yellows would look awesome against the dark chocolate color of the cookie. I adapted this recipe from the one provided with the chips, but I added in more chocolate (of course!). 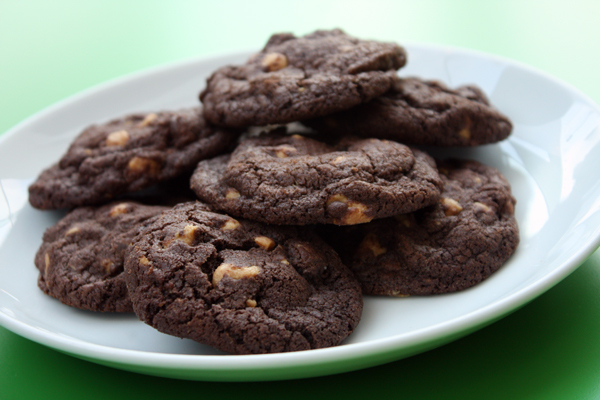 It makes a TON of cookies – I got nearly 5 dozen out of it – so you’ll have plenty to share! 2. In a large bowl, sift together the flour, cocoa powder, baking soda, and salt. 3. In the bowl of your mixer, beat together the butter and sugar until light and fluffy. Add in the eggs and vinall and mix well. 4. Add in the flour mixture and beat well. Finally, stir in the peanut butter chips and chocolate chips. 5. Place rounded tablespoons of the cookie dough onto a baking pan. (As usual, I used my favorite tool – the cookie dough baller!) Bake them for 8-9 minutes. Allow them to cool on the pan for about 10 minutes before moving to a wire rack to cool completely.